Ramban was one of the greatest Biblical scholars of all times. The Ramban (Rabbi Moshe ben Nachman – aka Nachmanides) stresses importance to the subject of the Lost Ten Tribes and spoke of them in several places. In the following articles Nachmanides gives us some important insights. There were actually thirteen tribes of Israel. The people of Israel include two sections, which are the Ten Tribes of “Israel” and the two tribes of Judah and Benjamin known collectively as Judah. Several Exiles occurred to the people of Israel. The Bible prophesied each one separately. Nachmanides discusses these prophecies and distinguishes between them. Just as part of Judah was exiled with the northern tribes so too did some people from the ten tribes remain with Judah. Their descendants are now to be found amongst the present-day Jews. The overwhelming majority of the Ten Tribes HOWEVER were exiled by the Assyrians and never returned though they are destined to do so. The Ten Tribes (said Nachmanides in ca. 1260 CE) are still in Tserefath (France and its neighborhood) and “at the ends of the north”, meaning at that time the northern areas of Europe. [Neh 11:1] And the rulers of the people dwelt at Jerusalem: the rest of the people also cast lots, to bring one of ten to dwell in Jerusalem the holy city, and nine parts to dwell in other cities. These same cities are also recalled as being in the inheritances of Judah and Benjamin in the Book of Joshua [when they first entered the land]. Together with all this we acknowledge the view of our sages may their memories be blessed and Heaven Forbid that we should not agree with them. They said in the Midrash Seder Olam, 12,000? These were those from the other Tribes who came up with Ezra. Israel included the ten northern Tribes. These were exiled by Sancherib [Sancherib in Rabbinical Literature is a figure taken to represent ALL of the Assyrian monarchs] as it says, “For he rent Israel from the house of David; and they made Jeroboam the son of Nebat king: and Jeroboam drave Israel from following the LORD, and made them sin a great sin” (2-Kings 17;11). “Until the LORD removed Israel out of his sight…so was Israel exiled out of their own land to Assyria unto this day” (2-Kings 17;12). from the neighboring tribes of Menasseh, Ephraim, and Simeon and these then dwelt in the heritage of Judah. This explains what was said concerning King Josiah, “They delivered the money that was brought into the house of God which the Levites that kept the doors had gathered of the hand of Manasseh and Ephraim, and of all the remnant of Israel, and of all Judah and Benjamin” (2-Chronicles 34; 9). Prior to that time in the period King Asa it was written, “And he gathered all Judah and Benjamin, and the strangers with them out of Ephraim and Menasseh, and out of Simeon: for they fell to him out of Israel in abundance when they saw the LORD his God was with him” (2-Chronicles 15; 9). those who had dwelt in their own territories adjoining Judah and had fled to Judah. They are referred to in a general sense as “from Israel” (in 2-Chronicles 35;18) and not by their specific tribes since they represented only a small portion of their tribe. These are they who returned under Ezra with the Jews from Babylon. They were not expressly mentioned by their tribes since they were attached to Judah. They all settled in the cities of Judah. There was no Redemption for the Ten Tribes who remained in exile. [1Chr 9:1] So all Israelwere reckoned by genealogies; and, behold, they were written in the book of the kings of Israel and Judah, who were carried away to Babylon for their transgression. [1Chr 9:2] Now the first inhabitants that dwelt in their possessions in their cities were, the Israelites, the priests, Levites, and the Nathins. Babylon. Ezra in Chronicles begins his account with Adam at the head and from whom all the genealogies begin. He keeps going in summary manner until he comes to our own tribes of Israel. He then first gives the genealogy of Judah at length. After that he does not give the genealogies of all the other tribes but only some of them and these he goes through in summarized form until he gets to Benjamin. He then becomes apologetic and says, “So all Israel were reckoned by genealogies; and, behold, they were written in The Book of the Kings of Israel” [1Chr 9:1]. This is as if to say that he does not need to recount their genealogies at length for they are still in exile. He goes on to say, “And Judah, who were carried away to Babylon for their transgression” [1Chr 9:1]. It is as if he is saying that, he really has only to relate the genealogy of one other tribe apart from Judah. The tribe spoken of is the tribe of Benjamin whose genealogy together with that of Judah he has already given. They are the ones who were exiled to Babylon and they are the ones returning in the time of Ezra. The other tribes have their genealogies given in “The Book of the Kings of Israel.” This book [-that we do not possess] is perhaps in their hands in their place of exile. Ezra then goes on to tell of the settlement of those who returned with him: “Now the first inhabitants that dwelt in their possessions” [1Chr 9:2]. That is to say, those who were the first to return from Babylon settled in their cities. These included Israelites, Cohans (i.e. priests), Levites, and Nathins as stated expressly in the Book of Ezra, “in the cities of Judah dwelt every one in his possession in their cities, to wit, Israel, the priests, and the Levites, and the Nathins, and the children of Solomon’s servants” (Nehemiah 11;3). [The Books of Ezra and Nehemiah are now separate books but Nachmanides refers to both of them together as “The Book of Ezra.”]. they were appointed on the gates of the Second Temple just as they had been so appointed in the First: “All these which were chosen to be porters in the gates were two hundred and twelve. These were reckoned by their genealogy in their villages, whom David and Samuel the seer did ordain in their set office” [1Chr 9:22]. We have explained this section in accordance with the opinion of our sages of blessed memory. 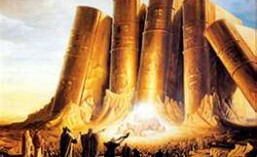 These said that in the time of the Second Temple a few refugees from the other tribes also came up. They did not come from all of the other tribes but only from Ephraim and Menasseh. [Another authority however, Tosefot in Arakin 32;a, says that, “from each and every tribe a few returned”]. These few were not enough to be termed a tribe in their own right or even part of a tribe. Due to their minority position they were included amongst the two tribes of Judah and Benjamin and dwelt in their cities. This Second Redemption was not meant for the other tribes. Look at the genealogy of the Tribe of Rueben in this Book of Chronicles and you will find that Ezra gives their familial connections until he reaches Beera who was exiled by Tiglathpileser the King of Assyria (1-Chronicles 5). He then stops. All of those other tribes whose family trees he mentions he also does not continue with after the Assyrian Exile. Rueben, Gad, and the half-tribe of Menasseh: “And the God of Israel stirred up the spirit of Pul king of Assyria, and the spirit of Tilgathpilneser king of Assyria, and he carried them away, even the Reubenites, and the Gadites, and the half tribe of Manasseh, and brought them unto Halah, and Habor, and Hara, and to the river Gozan, unto this day” [1-Chr 5:26]. escaped from the sword carried he away to Babylon; where they were servants to him and his sons until the reign of the kingdom of Persia” [2-Chr 36; 20}. The Book of Chronicles speaks of the exile to Babylon and of the first year of Cyrus, “Now in the first year of Cyrus king of Persia” [2-Chr 36:22]. The Book of Ezra also speaks of these events in the same way and this is additional proof that Ezra wrote Chronicles. Where Chronicles finishes the Book of Ezra begins. They are in effect like unto one book concerning genealogies and the Second Redemption that took place at that time. We have not revealed very much that is new in the above discussion but by bringing a few scattered verses together we have clarified an issue. It has been made quite clear from our study that the only ones who returned from the Babylonian Exile were they who belonged to the Kingdom of Judah. Those however who are termed the House of Ephraim, or The House of Israel, meaning the Ten Tribes are still in Exile in Assyria. These Tribes did not have any participants in the Second Redemption, as I have noted. stage since they knew their time had not come. carried away captive his forces, and foreigners entered into his gates, and cast lots upon Jerusalem, even thou wast as one of them. them; and there shall not be any remaining of the house of Esau; for the LORD hath spoken it. France, Abarbanel says it means France and Britain]. These places are at the extremes of the north. The verse continues, “and the captivity of Jerusalem, which is in Sepharad, shall possess the cities of the south” [Obadiah 1:20]. Those who were exiled to “Sepharad” [meaning Spain] were the Jews of Jerusalem who were taken away by Titus and Vespasian when the Second Temple was destroyed by the Romans and not before then. 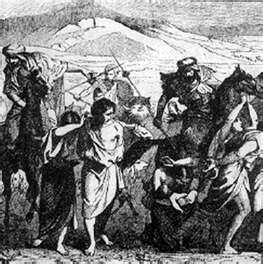 The others were the Ten Tribes who were exiled in the First Exile. These have not returned as has been claimed. When did they [the Ten Tribes] come back and when were these enormous exiled groups ingathered to inherit the cities of Ephraim and Samaria? When did saviours go up on Mount Zion to judge the mount of Esau? In the time of Ezra only a few returned as pigeons to their dovecotes. It says, “the kingdom shall be the LORD’s” [Obadiah 1:21]. At that time everyone will openly acknowledge the Kingdom of God. “And the LORD shall be King over all the earth” (Zechariah 14;9). This too will happen in the future. The general principle concerning these and all similar verses concerning the Redemption of Israel and the fall of Edom and the like is that it is all for the future. “The punishment of your iniquity is finished daughter of Zion; he will no more carry you away into captivity. He will visit your iniquity, daughter of Edom; he will discover your sins” (Lamentations 4;22). This is all for the future. “He will no more carry you away into captivity,” is instructing us about the future redemption. If it was otherwise what would be the point of saying to those in exile that they would no longer be exiled unless it meant that they really are destined to be redeemed from the exile they are in? Also, “he will visit your iniquity, daughter of Edom; he will discover your sins”, must be for the future. It could not be speaking of the past for it was they [i.e. the Israelite Jews] who were beaten by Herod the Edomite in the time of theSecond Temple. It all must pertain to the future. It is impossible that this was all conditional, that they did not deserve it, and that the prophecies were spoken for nothing. It is pertinent that at the time of their exile Israel were sinning and transgressing. Even so, it was prophesied, “The punishment of your iniquity is finished daughter of Zion; he will no more carry you away into captivity” (Lamentations 4;22). This was not conditional, meaning to say that on condition that they repented then they would have been redeemed. This is not the way of Prophecies to make such limited conditions. Rather it all pertains to the future. Zechariah lived in the Second Temple period. Zechariah said, “Behold, the day of the LORD is coming,” and so on in great detail that without any doubt can only be referring to some future day. So too, were these passages explained by the Commentators and by our holy sages of blessed memory. Just because one is not Jewish does not mean that one cannot be a literal, bloodline child of Israel. There are many more Israelites in the world than there are Jews. As to who they are, where they are and how they can be recognized and identified, read on. We all know that there are twelve tribes to Israel. Long before the return from Babylon of some of the exiles from Judah in 516 b.c.e. (that’s 2,529 years ago), the identities of the vast majority of the other tribes of Israelites had been lost. It was a remnant of the southern Kingdom of Judah that returned to rebuild Jerusalem. Therefore since then, the remnant of Israel has been called by their name. Thus we have Jews, named after Yehudah, or Judea. While human history deals exclusively with the Jews from this point onward, we must never forget that God’s promises to Israel were meant for, and to this day are being fulfilled with, the entire nation of twelve tribes, and not just the one, called the Jews. To this day, the other eleven tribes, considered lost, are still as much a part of Israel, as are Judah. The other eleven, while maybe lost to their own identity are still known to Heaven, and are therefore, still under Divine protection and Divine blessing. The other eleven, whoever they are, and wherever they may be, are still as much God’s chosen as is Judah. Therefore, whether certain elements of Judah, or the nations, like it or not, there are still over ten times as many Israelites “out there” somewhere, who are the bonafide chosen people of God. To this day they are also being guided by Heaven’s Hand and fulfilling Heaven’s purpose as being a “light to the nations,” even as Judah is used to this day. Today, many ask the question, who is a Jew? One can answer this in according to Torah Law, and say that a Jew is defined as one born from a Jewish mother, or one who has gone through a conversion process deemed acceptable by whomever is doing the accepting. Yet, this narrow interpretation only identifies who today is considered a Jew, and who is therefore eligible for recognition within the Jewish community, and possibly eligible for citizenship within the State of Israel. But, no matter how we define today who is, or who is not a Jew, this bears no influence upon the greater question of who today is Israel. For this bloodline identity, lost over so many centuries, still has not gone away, and never will. Over many centuries, there have been identified an Israelite presence in some of the most far-flung corners of the Earth. There are records and rumors of Israelite communities (that may not be Judah-based “Jewish”) in China, India, Afghanistan, Ethiopia, southern Africa, and even among Native Americans. While today, “Jews” are considered, for the most part, to be a nation of white Caucasians, the vast majority of other native Israelites, however lost they may be, are far from being white Caucasians, and most likely consist of ever other color and race found over the Earth. Indeed, historically, it is well known that Israel, which includes Judah (and thus all real Jews) are a Semitic race. Semites are not Caucasians. Therefore, while the majority of modern Jews can be identified to be Caucasians, this clearly shows how, over many centuries, they too have become subject to intermarriage and racial change. How interesting is it today that modern haters of Jews accuse the majority of European Jews of not being truly Jewish. European Jews are accused of being decedents of Khazarian converts from over a thousand years ago, and therefore, the haters proclaim, not true Jews at all. This is such a twisted and peculiar argument. For the haters of Jews, hate the Jews because they are Jews, and at the same time deny them the identity of being Jews. If the Jews are not Jews, then why hate them for being Jews? Funny isn’t it, that even if the Jews are not Jews, they are still hated for being Jews? Is there any logic in this? No, none! But, whoever said that hatred was based upon any logic? Whoever said that hatred had to make any sense? For the record, there is a large amount of DNA evidence that tends to prove that European Jews are in fact not of Khazarian ancestry. What it means to be God’s chosen people has become subject to such wild misinterpretations, that its true meaning has been almost entirely lost. Let us endeavor now to restore the true understanding of this. Torah makes it clear that God calls Israel a nation of priests. Fine, so then, what is the role of the priest? The priest is a servant. The priest goes out and serves the needs of the community. The priest is not elevated and thus served by the community. A priest serves, he is not served. Being a priest is an arduous and difficult task. It requires hard and often dirty work. But that is the role of the priest. The priest is a tool in God’s Hand. When God wants to get work done in this world, he acts through His priests. Yet, the work of God, like the work of the priest in the ancient Temple is often hard and dirty. The priest is a tool. He is like a screw used by God to screw together two or more disjointed things. God uses the priest as His screw to build, to bind, to bridge and unite things. Just remember this, the job of a screw is to get screwed. This is the role, the job and mission of Israel. Israel is chosen to be God’s priests, His workers, His tools, His screws. When Israel is getting screwed, this is when they are doing the job of Heaven. This is when they are fulfilling their role as the chosen people. It is nothing grandiose. On the contrary, it is a rather dirty and difficult job, often without much appreciation or reward. Who ever thinks about the screws that hold together the walls of the houses in which we live? Who ever thinks about the unnamed and forgotten ones whose inspirations have built everything good that we have in the world? Who is Jew today is one definition, one clearly defined by Torah Law. Who, however, is Israel is a completely different definition. A Jew can be recognized by his bloodline or his conversion, an Israelite may have neither of these to show, and not need them either. An Israelite has an Israelite soul and as such has a unique relationship with Heaven as does all the children of all the twelve tribes, not just the Jews of Judah. While I cannot accept any Israelite (confirmed or otherwise) into Jewish ritual practices unless he meets the criteria of also being a Jew, nevertheless, I accept him as a member of my extended family and is he welcome in my home, even though I may not be able to include him in my minyan. It is important that we expand our horizons. It is important that we make every effort to start seeing things through God’s Eyes, instead of through our own. Times are changing, and revelations, shocking ones, will be forth coming. Let us prepare for these by rejecting the falsehoods and half-truths of the past, and by embracing expanding perceptions of the ancient truths.